Wyoming after the American Civil War: during a blizzard, ‘The Bounty Hunter’ Major Marquis Warren (Samuel L. Jackson) attempts to transport three dead bodies to the city of Red Rock. He manages to hitchhike on a stagecoach driven by O.B. Jackson (James Parks). The vehicle is occupied by another bounty hunter, ‘The Hangman’ John Ruth (Kurt Russell) famous for bringing in outlaws alive so as to see them hang, and ‘The Prisoner’ Daisy Domergue (Jennifer Jason Leigh), a dangerous criminal fugitive whom Ruth escorts handcuffed to him to Red Rock. Despite initial reservations, the ‘Hangman’ and Warren eventually bond over the Major’s personal letter from President Abraham Lincoln. On their way, they pick up the erstwhile Lost-Causer Colonel Chris Mannix (Walton Goggins), who contends that he is traveling to Red Rock to become ‘The Sheriff’ of the town. Wary of the newcomer’s intentions, Ruth and Warren ally to protect their respective bounties. Because of the blizzard the little group must seek shelter at the stagecoach lodge Minnie’s Haberdashery, where Bob ‘The Mexican’ (Demián Bichir) welcomes them by claiming that the owner left for her mother and that he is in charge of the place now. Inside, they meet ‘The Little Man’ Oswaldo Mobray (Tim Roth), an English hangman, as well ‘The Cow Puncher’ Joe Gage (Michael Madsen) and “The Confederate”, former general Sanford Smithers (Bruce Dern) – and then the weirdness begins. 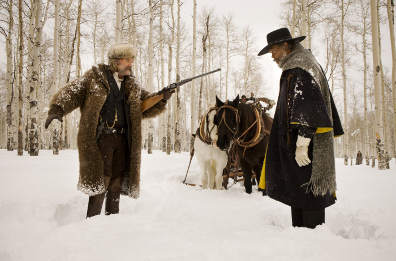 In a sense, The Hateful Eight might be Quentin Tarantino’s most ambitious film so far. It does not contain much of the action we’re so used to in his movies. Neither is it a ‘classic’ American or Italian western in the way Django Unchained was. It’s rather a sort of intimate play, a locked-room mystery reminiscent of vintage detective stories. We don’t get to see many other outside locations, with the exception of the snowy landscape during the overture and few outside scenes around the Haberdashery. This setup, however, creates some intrigue of its own – in a double sense. Tarantino coops up eight nefarious individuals in a lodge, none of whom may be who they actually claim to be. The Hateful Eight moves slowly, but in the course of the film, ultimately all will be revealed. The director’s films have always contained a lot of dialog. His latest movie, though, tops all of his previous ones in this respect. A negative interpretation would be to call it garrulous. Yet that wouldn’t really do The Hateful Eight justice. In spite of its unhurried pace, Tarantino’s recent work manages to establish a fascinating atmosphere, partially due to Robert Richardson’s beautiful widescreen cinematography and Ennio Morricone’s marvelous score. While this soundtrack may not rate as his top set of compositions, the Oscar that the Italian grandseigneur finally received for his contributions to The Hateful Eight was long overdue. Incidentally, it also creates a connection to Sergio Leone’s old Italian westerns, which had their fair share of shady characters as well. Generally speaking, Quentin Tarantino has been very careful to tie his current movie with his own former ones. In terms of personnel, Michael Madsen establishes a link to both his debut Reservoir Dogs and Kill Bill, whereas Samuel L. Jackson brings back memories of Jackie Brown, Django Unchained and his masterpiece Pulp Fiction. The same goes for Tim Roth, who already worked with the director on his first two films, and Kurt Russell, who was the leading man in 2007’s Death Proof. Ennio Morricone and Robert Richardson complete the circle of Tarantino movies, both having already collaborated with him on 2009’s Inglourious Basterds. So there’s definitely a certain familiarity with a number of faces both in front and behind the camera that is to be appreciated. While several of the actors featured in The Hateful Eight may be stars in their own right – Samuel L. Jackson, Kurt Russell, and Tarantino newcomer Channing Tatum in a supporting role come to mind – this is a true ensemble performance. Each of the personages is similarly important to the overall story. Therefore the movie wouldn’t really work as a star-driven vehicle. In fact, The Hateful Eight often resembles a stage play, for a good deal of it could be also performed in a playhouse as a character sketch. For the most part, there’s plenty of talk and little action, which makes the film a welcome aberration in the Hollywood of today – but also suggests why The Hateful Eight could never become a blockbuster in the 21st century. So what to make of the film? It all comes down to your expectations. If you go to see the movie anticipating another Inglorious Basterds or Django Unchained, you’ll be sorely disappointed. In case you enter the universe of The Hateful Eight with an open mind and aren’t opposed to a lot of dialog during a running time of almost three hours, this might be just the film for you. It’s not the most accessible Quentin Tarantino movie ever – far from it, actually – but it also shows that he’s willing to take some risks while not completely abandoning some of his trademarks, such as the quirky humor and the profanity. At the very least, The Hateful Eight demonstrates just how beautiful a western mystery set in a single room can occasionally look and sound. Seen at Harmonie Kinos, Frankfurt am Main, on 18 March, 2016.